Xiaomi is working on its new flagship which was in the leaks for quite a long time, Mi Mix 2S. This smartphone is an upgraded version of the Mi Mix 2; it will come with the latest hardware like the Snapdragon 845 and dual camera setup. The design is going to be similar to the previous one according to the leaks. We are summing up a bunch of leaks and speculations about the Xiaomi Mi Mix 2S, let’s dive in. The smartphone is going to be similar in design and looks to the Mi Mix 2 with a thin chin at the bottom of the display and the front-facing camera is placed on it. This front facing camera placement is confirmed by XDA Developers when they stumbled upon a code line in the leaked firmware files, check out the screenshot below. Another speculation about the smartphone is that it will come with a dual camera setup. 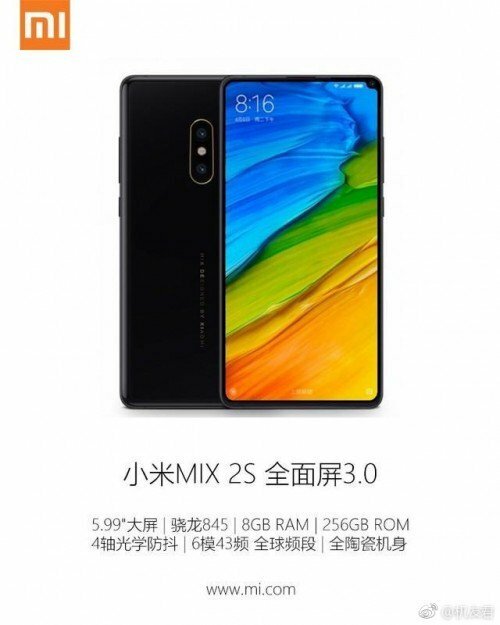 This comes from the same leaked firmware images where XDA developers found the watermark which reads ‘Shot on Mi Mix 2S, AI Dual Camera.’ A picture also shows the dual camera of the smartphone at the back. Another rumor is going on the internet is that the smartphone will be featuring a glass back with the wireless charging. The smartphone will feature the same design as the Xiaomi Mi Mix 2 and it will be launching in the near future. The smartphone will also feature the AR Core with some cool AR features in the camera and there mightbe some cool VR features.